A couple of weeks ago I teamed up with the talented Sophie for another collaboration. This time it included some beautiful vintage clothes from my favourite vintage pay by the kilo - Preloved Kilo. Check out their Facebook page to make sure you don't miss out on the next event near you! I have a post coming up shortly about their event so stay tuned for that! If you're a lover of vintage, this is the place for you. I love that there are continuous replenishment of the clothes, which means you're going to get a good variety of fashion all day long. 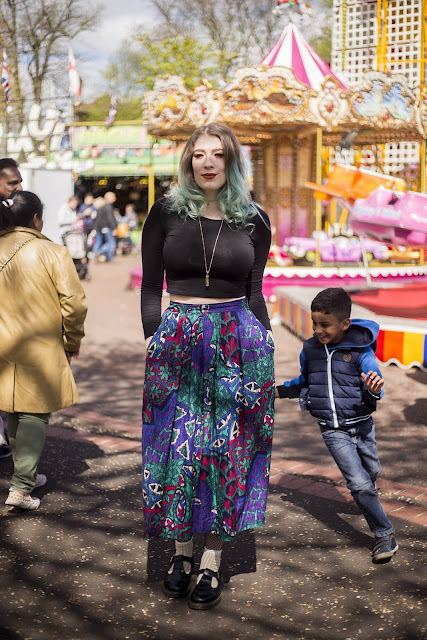 The lovely Sophie had the great idea of going to the fair at Chapelfield Gardens, and the photos look amazing! Sophie did an incredible job as always. As previously said, all clothes are from Preloved Kilo. If you want to see mine and Sophie's previous collaboration, you can see it here on here blog. I hope you enjoy the photos. Don't forget to check Preloved Kilo and Sophie out! in the links above.